Capt. Dan Shaffer and the crew of the DESPERADO were trolling about a mile off Palaoa Point Lighthouse on Lanai when one of their Penn 80STW reels sounded off. 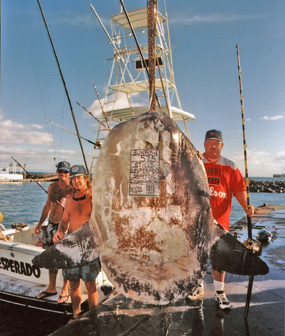 They'd hooked an enormous and unusual fish, a sun fish weighing 575 lbs! Also known as a "mola mola" this fish is often found at the surface of the ocean basking or swimming lazily. It is reputed to reach over 1,000 lbs in size.